Cold Feet Quilter: Let me be the first to say, Happy Birthday Michelle! Let me be the first to say, Happy Birthday Michelle! It happened in the blink of an eye. My daughter hits a new decade on August 4th. This is the silly quard I made for her birthday. & here is the crazy quilt that I did entirely in my longarm. Pieced & quilted all in one. It's the first large quilt I've done like this. 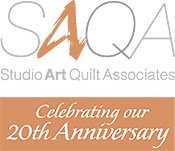 The first small one I did several years ago for the Quilt Alliance challenge, that Ally Aller bid on & won. & included in her first book. This one I used a wavy rotary cutter, to cut all the pieces. I layered a solid black fabric on top of the batting, & then pieced leaving the black to show between the raw edges. It has a soft minke back & will keep her warm in winter. This last is a piece of silk, that I painted on a nice sunny day on my deck last week. What a special card and quilt! How true is it that the time just seems to fly by. A beautiful way to say I love you! 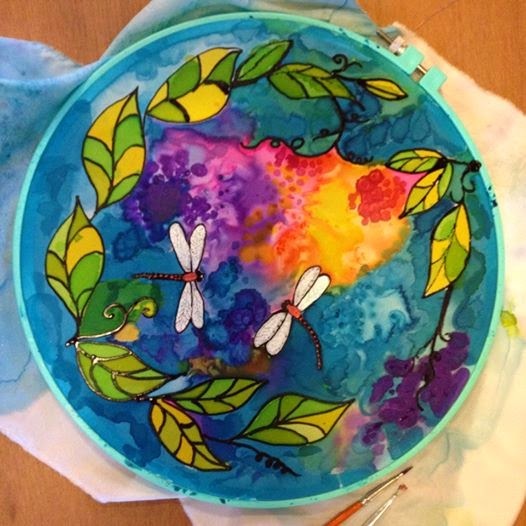 Your silk painting is delightful! How you ever thought of making the whole quilt on your long arm is beyond me! Love it. Reminds me of a puzzle. I like your silk painting also, can't wait to see what you do with it.